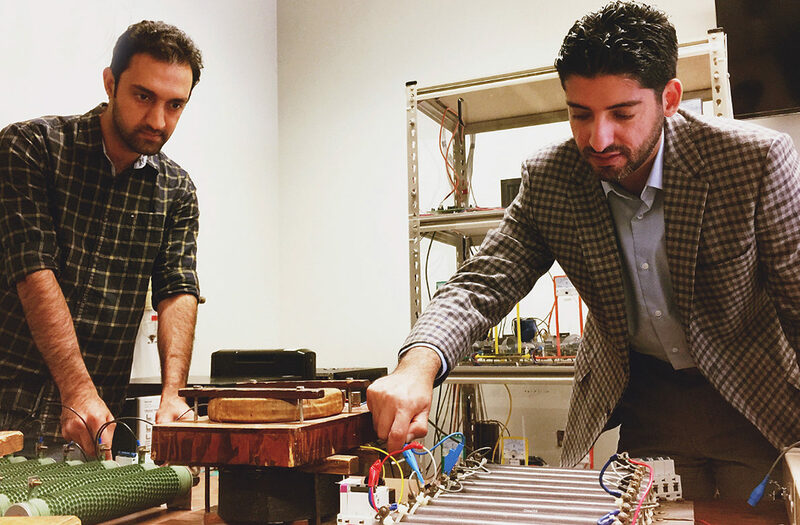 Mohammad Mousavi, Ph.D. graduate student in power engineering, and professor Ali Mehrizi-Sani. PULLMAN, Wash. – Washington State University researchers have designed a new type of controller that addresses one of the biggest challenges of integrating renewable energy into the power system—maintaining a stable power supply. Led by Ali Mehrizi‑Sani, associate professor in the School of Electrical Engineering and Computer Science, graduate students Saleh Ziaeinejad and Mohammad Mousavi designed a controller for future renewable-based power systems. The researchers have successfully tested the controllers on a simulation platform and are planning to implement it on their testbed in Mehrizi‑Sani’s lab. The results of the work have been published in IET Generation, Transmission & Distribution journal. Controllers are used in power plants to balance electricity generation with the electrical load. Conventional power plants use rotating turbines to store kinetic energy through the physical property of inertia. This energy can then be used if needed during fast disturbances to help with power system stability. Power systems increasingly rely on renewable-based generation units which do not contain turbines and so cannot use inertia to maintain a stable power supply. The power industry has struggled with how to maintain the delivery of electricity in renewable-based units which use power electronic converters. Previous research to develop controllers for converter-based power systems mostly focused on mimicking the behavior of conventional electric generators to emulate inertia. The WSU researchers designed a new mechanism that is a first step in allowing the power system to handle power sharing, changes in electric load, and faults. “Our proposed method is such that even though the power converters have no inertia, they still can maintain the stability of the power system,” said Ziaeinejad. “It is very exciting to be playing my part in helping the world move towards next-generation power systems,” he added. Funding for the project came from the Electric Power Research Institute, a consortium of electric utilities, vendors and government agencies based in Palo Alto, CA.